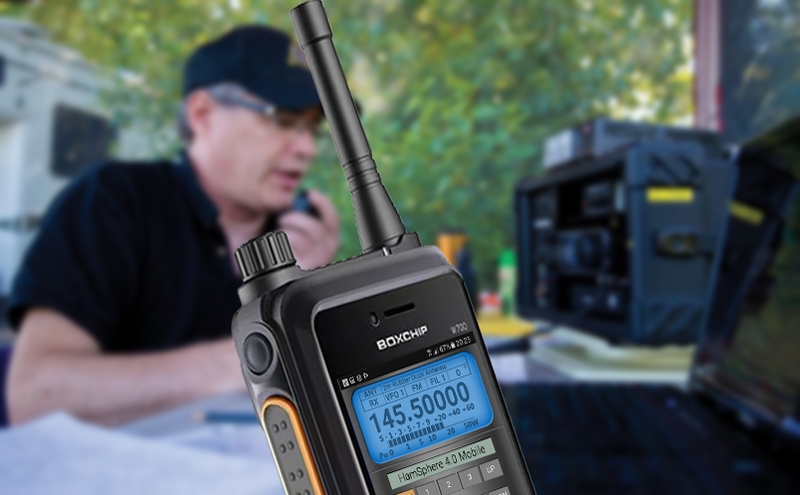 The RFinder is the most advanced DMR Transceiver combined with an embedded powerful smartphone. It delivers up to 4 Watt of RF Power out of its very robust case. Running Android, you can install all the available Play Store apps. This means that you can install Zello, Team Speak, EchoLink and many others and use the built-in PTT button to key the transmission on such apps. Can you imagine that? If you don’t reach an EchoLink node, just use your RFinder 3G, 4G or even WiFi, and you are connected. Never miss a QSO again just because there isn’t a nearby repeater. And because the RFinder has an updated database of worldwide repeaters, EchoLink nodes and DMR talk groups, you never have to memorize anything. You just search the station or repeater you want to connect, and the RFinder will change all the settings for you, either using DMR or conventional analogue FM. The RFinder is so advanced that will allow you to see on a map all the available DMR/EchoLink/Conventional repeaters nearby. Just click on your selected station, and your radio settings are changed: RX and TX frequency, Tones, offsets, splits, color codes. Everything! Welcome to the first Click & Talk transceiver. If this is not fenomenal what is it then? RFinder – The World Wide Repeater Directory is a database of Amateur Radio repeaters worldwide. We have 60.000 repeaters in 170+ countries. We have created the Earth’s most feature complete apps for Android and iOS… now the RFinder team kicks it up another notch… with the first Software Defined HT (SDHT), based on Android, with integrated GSM/4G LTE. RFinder is the official repeater directory/app in twelve countries…for more info just visit http://subscribe.rfinder.net. – RFinder isEl directorio de LRMDetidor con la base de datos oficial de Unión de Radioaficionados Españoles…ES Amateurs who subscribe contribute to URE ES. – RFinder is the Official Repeater Directory of Rede dos Emissores Portugueses…PT Amateurs who subscribe contribute to REP PT. – RFinder is the Official Repeater Directory of Liga de Amadores Brasilieros de Radio Emissão…BR Amateurs who subscribe contribute to LABRE BR.